HOW TO USE: Take this medication by mouth with or without food as directed by your doctor, usually three or four times daily. The dosage is based on your age, medical condition, and response to treatment. In children, the dosage may also be based on weight. Do not increase your dose or take this medication more often than directed. Tell your doctor if your condition does not improve or if it worsens. 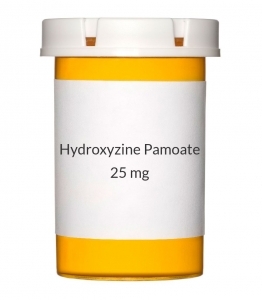 PRECAUTIONS: Before taking hydroxyzine, tell your doctor or pharmacist if you are allergic to it; or to cetirizine; or to levocetirizine; or if you have any other allergies. This product may contain inactive ingredients, which can cause allergic reactions or other problems. Talk to your pharmacist for more details. Before using this medication, tell your doctor or pharmacist your medical history, especially of: breathing problems (such as emphysema, asthma), high pressure in the eye (glaucoma), heart problems, high blood pressure, kidney problems, liver problems, seizures, stomach/intestine problems (such as ulcer, blockage), overactive thyroid (hyperthyroidism), difficulty urinating (for example, due to enlarged prostate). This drug may make you dizzy or drowsy or cause blurred vision. Do not drive, use machinery, or do any activity that requires alertness or clear vision until you are sure you can perform such activities safely. Avoid alcoholic beverages. Before having surgery, tell your doctor or dentist about all the products you use (including prescription drugs, nonprescription drugs, and herbal products). Children may be more sensitive to the side effects of this drug. This drug can often cause excitement in young children instead of drowsiness. Older adults may be more sensitive to the side effects of this drug, especially drowsiness and confusion. During pregnancy, this medication should be used only when clearly needed. Discuss the risks and benefits with your doctor. It is unknown if this drug passes into breast milk. Consult your doctor before breast-feeding.